2012 Calendars are Here . . . The 2012 Farmers National Bank Calendars are in and available now at your local Farmers National Bank location. This year's calendar features pictures from all of the our markets. 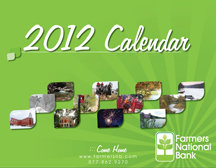 To view the calendar, visit our website www.farmersnb.com or click here click here.